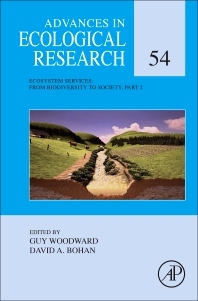 Advances in Ecological Research is one of the most successful series in the highly competitive field of ecology. Each volume publishes topical and important reviews, interpreting ecology as widely as in the past, to include all material that contributes to our understanding of the field. Topics in this invaluable series include the physiology, populations, and communities of plants and animals, as well as landscape and ecosystem ecology. Guy Woodward is Professor of Ecology in the Department of Life Sciences at Imperial College London and Series Editor for Advances in Ecological Research. He has authored over 100 peer-reviewed publications, including recent papers in Nature, Science and Nature Climate Change, with a strong emphasis on understanding and predicting how aquatic ecosystems and food webs respond to a wide range of biotic and abiotic stressors, including climate change, chemical pollution, habitat degradation and invasive species. Much of this work covers multiple scales in space and time and also a range of organisational levels - from genes to ecosystems. His research group and ongoing collaborations span the natural and social sciences, reflecting the need for multidisciplinary approaches for addressing the environmental challenges of the 21st Century. Dave Bohan is an agricultural ecologist with an interest in predator-prey regulation interactions. Dave uses a model system of a carabid beetle predator and two agriculturally important prey; slugs and weed seeds. He has shown that carabids find and consume slug prey, within fields, and that this leads to regulation of slug populations and interesting spatial ‘waves’ in slug and carabid density. The carabids also intercept weed seeds shed by weed plants before they enter the soil, and thus carabids can regulate the long-term store of seeds in the seedbank on national scales. What is interesting about this system is that it contains two important regulation ecosystem services delivered by one group of service providers, the carabids. This system therefore integrates, in miniature, many of the problems of interaction between services. Dave has most recently begun to work with networks. He developed, with colleagues, a learning methodology to build networks from sample date. This has produced the largest, replicated network in agriculture. One of his particular interests is how behaviours and dynamics at the species level, as studied using the carabid-slug-weed system, build across species and their interactions to the dynamics of networks at the ecosystem level.